Named after its creator, John McAfee, McAfee Antivirus has been among the top antivirus brands since it was launched, with continuing recognition as being among the best antivirus software options on the market. With nearly 30 years experience in PC protection, McAfee is still a top player in the industry, under the current ownership of Intel Security Group. McAfee offers 30 different cyber protection products ranging from mobile phone security to the protection of servers in large organizations. 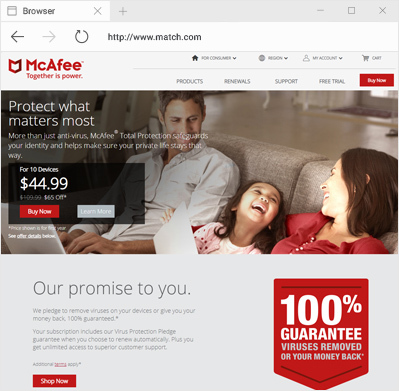 This review looks at McAfee’s computer protection product. Our testing found McAfee’s antivirus software to be very dependable overall, and in fact, it performs above average for the industry. In terms of usability, McAfee again far exceeds the industry standard by having zero false malware flags for legitimate software, a flaw found much to frequently elsewhere in this industry. McAfee’s user interface is also more user-friendly than its competitors. Identifies and deletes malicious software including adware, spyware and viruses. Spyware surreptitiously observes every action you take on your computer. Its most common purpose is to acquire your passwords, login information for online banking,and credit card numbers. Assesses every website you visit to determines if they are safe and trustworthy; all malware websites and downloads are blocked. Deceptive or 'spoof' websites are frequently are accessed after the user clicks a link in a fake email, and are intended to collect your personal information. Running in the background on a continual basis, real-time security monitors your system and blocks any malware from reaching the hard-drive. Adware is malicious software that once on your system, will download or display banner or pop-up ads and other advertising material. By encrypting your Internet connection with a VPN, you can browse anonymously and prevent hackers from accessing your data. Establish your own schedule for antivirus system scanning and specify the locations you want to be scanned. Enables users to effortlessly manage a multitude of passwords securely in one location. Manage the Windows firewall and advanced firewall tools remotely. Experian is integrated into McAfee to protect your identity both online and off. Enables users to effortlessly clear their web browser’s history, cache and cookies. Tools to improve your computer’s speed and optimization of your computer are included. Complementing an excellent product, McAfee’s customer service is similarly high-quality, with the option of using online chat, email, and telephone for no extra cost. McAfee’s support professionals will quickly address any technical or billing issues Customers also have the option to upgrade to Priority Support for even more immediate responses to inquires. 24/7 telephone support for questions related to billing and technical issues. Online chat support is available to promptly deal with questions and problems.